April 26 marks twenty-five years since the world saw the worst nuclear accident in our collective history. With all eyes on Fukushima at the moment, this is a telling reminder of the dangers of a technology we do not necessarily fully understand. The need for an almost inexhaustible source of clean power is more apparent than ever as we face the mounting concerns of global warming and rising levels of pollution. Burning fossil fuels no longer seems sustainable especially in light of the development of other highly populated industrialized nations like India and China. The United States with its population of three hundred million is the biggest polluter on the planet. What is the situation going to be like when these other nations in building cars, new coal-fired electrical centres, and manufacturing plants reach the same levels of smog? Are we all going to end up walking around outside having to wear some sort of mask with a breathing apparatus? Public opinion is just that, the opinion of the public and the ebbs and flows of what is in the forefront of the collective conscious at any particular moment may be based more on publicity and marketing than on an honest assessment of the situation. Like a herd of gazelle that becomes spooked then sets off in a gallop, the actions of the many are determined by the actions of the few. I see my neighbour running; I guess I should run too. If you will permit me a brief detour. Last October, I did my first, well, only tandem parachute jump. Scary. (see my blog Parachuting: If God had meant me to…) Before jumping, I did a little research to check out how safe this sport was and surprise, surprise. In case you haven’t guessed, there is a small risk associated with this sport. Sign away your life or go home. But looking at the numbers, I just have to laugh. We truly don’t understand what’s going on around us and get scared for all the wrong reasons. That’s hilarious! You are almost 17 times more likely to die getting in your car than by jumping out of an airplane; 1 in 100,000 versus 1 in 6,000. However, I like how the web site howstuffworks explains why we’re afraid. * Familiarity: we are familiar with cars; we drive them; nothing bad happens; we think it’s safe. It’s only when we check out the stats we may clue in to just how dangerous cars really are. The Guardian newspaper published on April 26, 2011, the article “Look at the science – smoking and obesity are more harmful than radiation” by Geraldine Thomas in which the author points out pretty much the same idea in regards to the latest kerfuffle over nuclear power in light of events at Japan’s Fukushima nuclear plant. The recent frenzy following the events in Japan suggests that the media are keen to feed our nuclear fears, by focusing on exposure to radiation that is extremely unlikely to result in a single death, compared with a natural catastrophe that has killed at least 20,000 people and displaced more than 100,000. Ms. Thomas goes on to rattle off statistics relating to the atomic bomb explosions at Hiroshima and Nagasaki plus the Chernobyl disaster, but the important point is the conclusion at which she arrives. The consequences for the most exposed group of atomic bomb survivors was an average loss of life expectancy significantly lower than that caused by severe obesity or smoking. I am not trying to suggest that the problems at Fukushima are not serious, but in reading over this article I realised – and I think I made the comment several times in my posts – that the topic of Fukushima seems to have completely taken over the reporting on events in Japan. 14,000 dead, 14,000 still missing at last count? Who cares; let’s report on Fukushima. If I look back on the comparison of parachuting and driving your car, in the United States, every year, every single year, over 30,000 people are killed in traffic accidents. (Wikipedia) Every year. Without fail. Worldwide, 1.2 million people are estimated to be killed each year on the roads – more than 3,000 people every day. 50 million people worldwide are estimated to be injured in road crashes each year. (FIA Foundation) Okay, we’re all scared about Fukushima turning into another Chernobyl but we are oblivious to the carnage that is happening right in front on us on our own roads every single day. Worldwide, over 57 million people died in 2002, nearly 30% of those deaths attributed to cardiovascular diseases. Anybody concerned about that? Heck, did anybody even know that? On 26 April 1986, it was decided at Chernobyl to take advantage of reactor number four’s downtime by carrying out a safety test on an emergency core cooling feature. At 1.24 am, an engineer recorded in his diary that the protective system was not working. At the same moment, a huge and catastrophic surge in power caused two explosions. 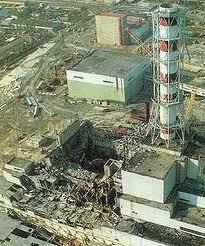 As fires raged, the core of reactor number four was destroyed. A huge cloud rose into the sky, spreading large amounts of radioactive fuel and materials into the atmosphere. I do not believe that nuclear power is 100% safe. Then again, I don’t believe automobiles are 100% safe but I drive one without thinking about it. Fukushima is a bad situation, however I believe that coming out of it will be new and better methods of dealing with nuclear energy. Is nuclear power overhyped as being safe? Maybe. But we certainly have to take a better look at what we’re going to do to produce power as burning fossil fuels is not going to be sustainable in the long run. The Chernobyl disaster was a nuclear accident that occurred on 26 April 1986 at the Chernobyl Nuclear Power Plant in the Ukrainian SSR (now Ukraine). An explosion and fire released large quantities of radioactive contamination into the atmosphere, which spread over much of Western Russia and Europe. It is considered the worst nuclear power plant accident in history, and is one of only two classified as a level 7 event on the International Nuclear Event Scale (the other being the Fukushima I nuclear incident, which is considered far less serious and has caused no direct deaths). The battle to contain the contamination and avert a greater catastrophe ultimately involved over 500,000 workers and cost an estimated 18 billion rubles, crippling the Soviet economy. The Chernobyl disaster triggered the release of substantial amounts of radiation into the atmosphere in the form of both particulate and gaseous radioisotopes. It is the most significant unintentional release of radiation into the environment to date. It has been suggested that the radioactive contamination caused by the Chernobyl disaster greatly exceeded that of the atomic bombing of Hiroshima and Nagasaki in 1945. However, the work of the Scientific Committee on Problems of the Environment (SCOPE) suggests that the two events cannot be directly compared, with a number suggesting that one was x times larger than the other; the isotopes released at Chernobyl tended to be longer-lived than those released by a bomb detonation, producing radioactivity curves that vary in shape as well as size. my blog: Let’s go green… er, black? A couple of years ago, I was reading an analysis in the editorial pages of the Toronto Star where the author [looked] at our green efforts. He listed off our various initiatives in North America like changing traditional light bulbs to more energy efficient ones, getting more green appliances, turning off unnecessary lights and dimming others, etc. Then he said that these types of efforts, while laudable were laughable when one took into account that at that moment, China was constructing a new coal-fired electrical power generating station every week. All of our light bulbs were dwarfed by the new developments elsewhere in the world which were leading to even higher levels of pollution.